July 4th Fireworks & Pops Concerts, Art, Free Movies, Fall Foliage, Playgrounds, More! 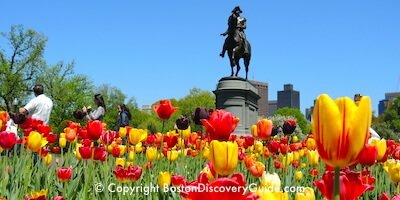 You may know Boston's Esplanade as the site of the nationally-broadcast Boston Pops July 4th concert and fireworks - but that's just the beginning of what you can enjoy here! 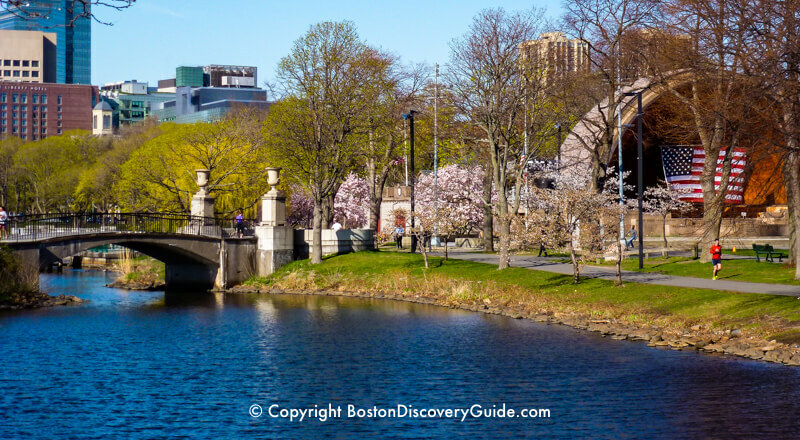 The Esplanade, a leafy park edging the Boston side of the Charles River, stretches along the water for about 3 miles from the Museum of Science to Boston University. The Esplanade provides an idyllic place to go for a run, stroll, or just settle into a chair and relax in the sun awhile you watch sailboats drift by. A narrow strip of land ("The Island") extends into the river and forms a sort of pool ("The Lagoon"). Small arched footbridges connect these areas, and paths link everything together. Although the Esplanade attracts lots of visitors for the Independence Day concerts, at other times of the year you'll find mostly locals and "temporary locals" (a.k.a. 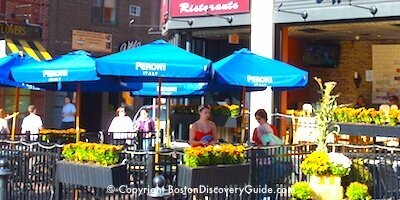 college students) than tourists here - maybe because you can get to it only by footbridges across traffic-filled Storrow Drive. Here are our recommendations for 10 fun things to do, see, and enjoy here throughout the year. 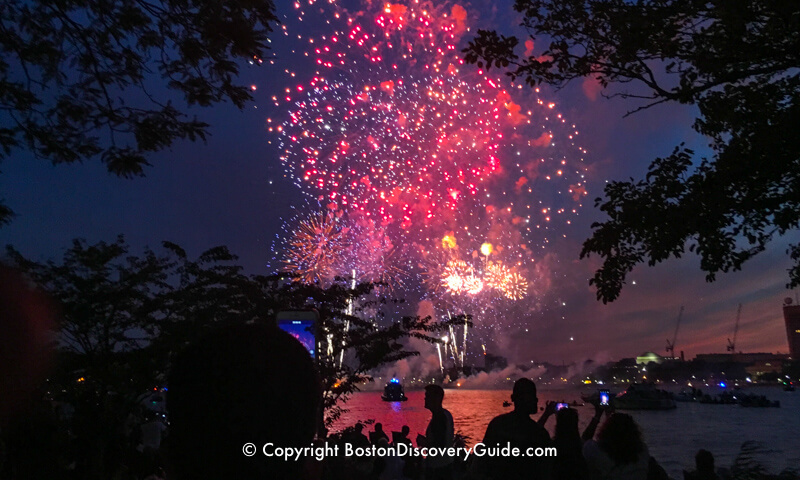 By far the biggest Esplanade events are the July 4th concert in the Hatch Shell and spectacular fireworks show to celebrate Independence Day. Up to a million spectators turn out for these famous events, and many of them stake out spots along the Esplanade or Cambridge side of the river. You can easily hear the music on both sides of the river, thanks to powerful speakers, but if you want a good view of the fireworks, you'll want to avoid being behind huge trees. 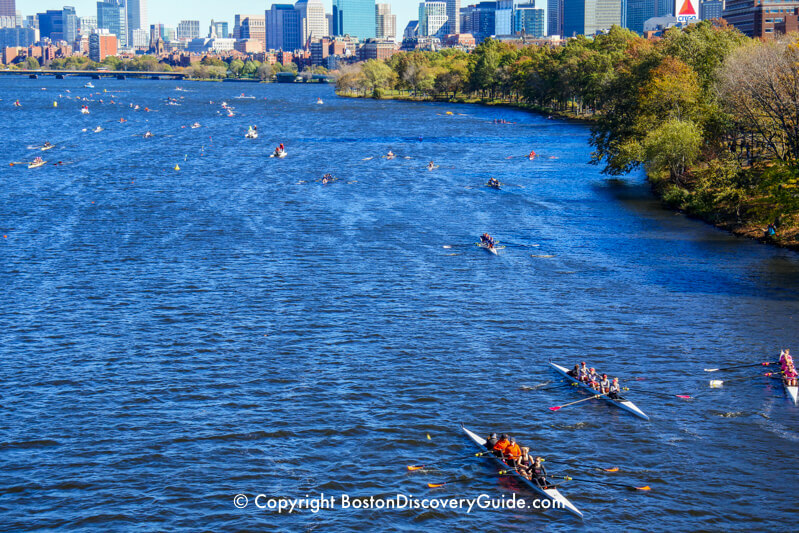 The 2-day Head of the Charles Regatta takes place every October along a 3-mile stretch of the Charles River, and is Boston's biggest rowing event. Hundreds of thousands of spectators line the river banks and bridges to watch almost 10,000 elite rowers from around the world compete in over 50 events. Check the October event calendar exact dates. Dragon Boat Races & Festival - Biggest dragon boat race in the U.S.
From late September through late November/early December, the Esplanade provides one of Boston's best viewing spots as breath-taking fall foliage colors paint the city gold, orange, and crimson. You'll find the best fall foliage views from the footbridges connecting the river bank with "The Island,"and from the floating docks on the river itself. 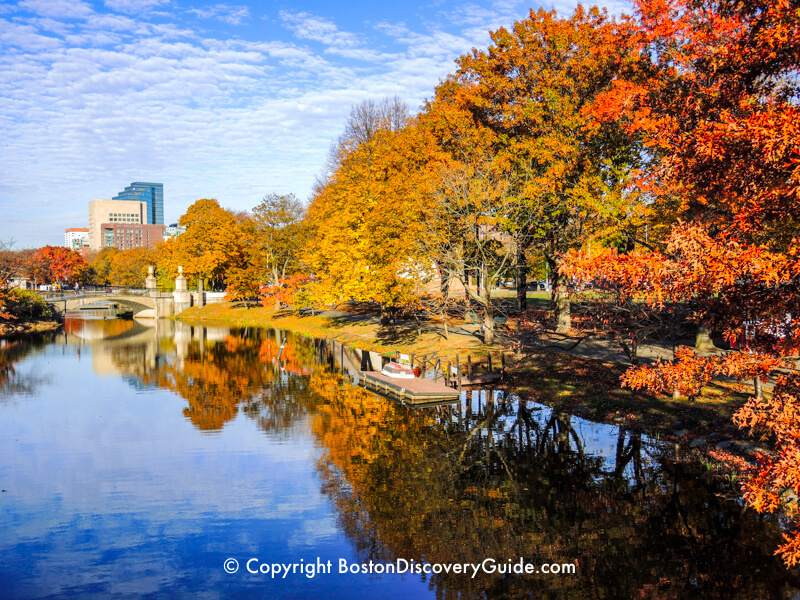 Or walk, run, or bike down the paths along the Esplanade to feel immersed in the gorgeous colors. 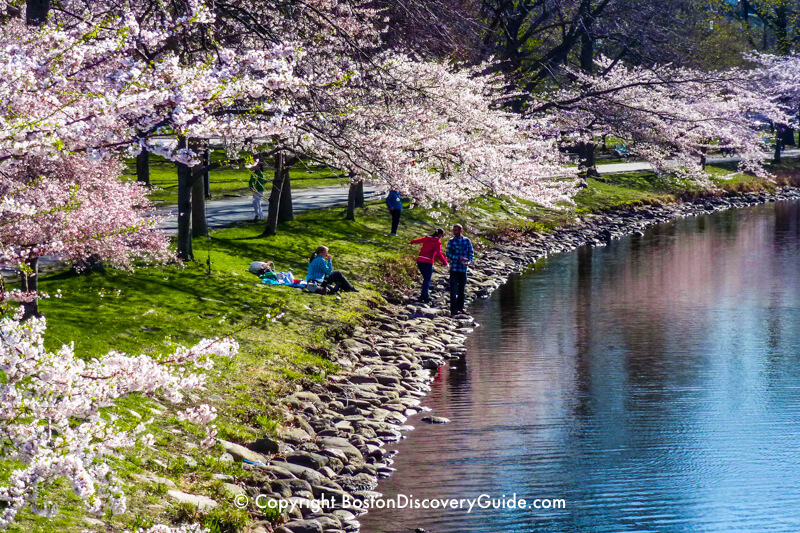 b totally transform Boston with a giddy display of color each spring, and there's no better place to experience this magical period than on the Esplanade, where dozens and dozens of cherry trees burst into full bloom, seemingly all at once. In reality, there are several different variety of cherries planted here, so they actually bloom over an extended period of time, giving you a longer opportunity to enjoy their beauty. 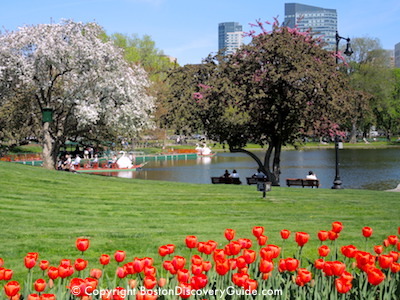 Stroll along the Esplanade's meandering paths, bring a picnic, soak up the beauty. 5. Relax on the Esplanade's "Beach"
OK, the five floating docks scattered along the Esplanade may not be a real beach, but they're a good substitute when you want to soak up some sun in the city. Even better, they're convenient to get to - and their relatively sheltered location means that as long as the sun is shining, you'll feel reasonably warm here - even on crisp November days! 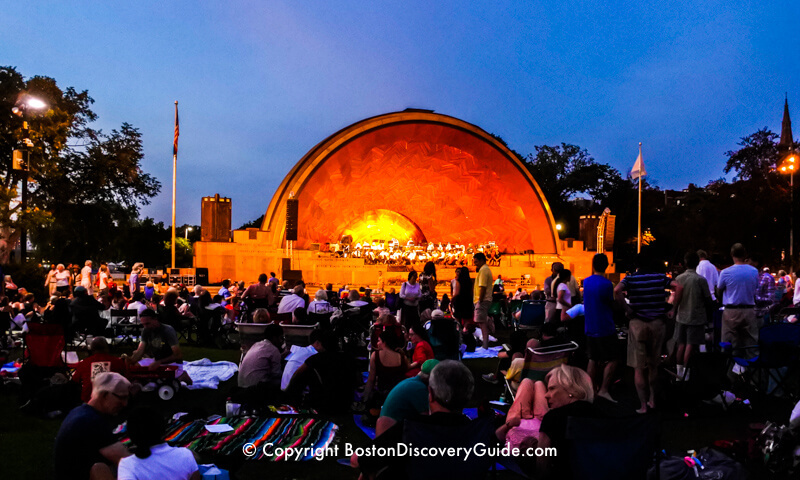 Almost every week throughout July and August, the Boston Landmarks Orchestra performs free evening concerts at the Esplanade's Hatch Shell, the gorgeous concert stage where the Boston Pops performs the July 4th concert. Bring a blanket and perhaps low folding chairs, a picnic dinner, and enjoy an evening of wonderful music under the stars. Find concert programs and dates on our July and August events calendars. Stoneman Playground on the Esplanade - As you can see, the swings aren't only for toddlers! Families love the Esplanade because of its three child-friendly playgrounds, bike paths (also perfect for rollerblading/inline skating), snowshoeing and cross-country skiing in the winter), sailing lessons for teens (more about that in a minute), and perhaps most of all, Free Friday Flicks at the Hatch Shell almost every week from mid-June through August. WBZ NewsRadio 1030 (Boston's CBS affiliate) sponsors the family-oriented feature-length movies, which begin at sundown and attract thousands of viewers. Check our June, July, and August event calendars for details. Esplanade Playspace (near the Hatch Shell and Fiedler Footbridge) - Designed for kids (5-12 years). Structures for climbing, zip lining, spinning, and swinging help increase upper body strength. Charlesbank Playground (near Museum of Science at Charles Street/Longfellow and the Teddy Ebersol's Red Sox Fields) - Play areas for toddlers, kids (5-12), and those with wheels (tricycles, bicycles) who will enjoy the paved path. The playground has climbing structures, tubes/tunnel, slides, and swings. 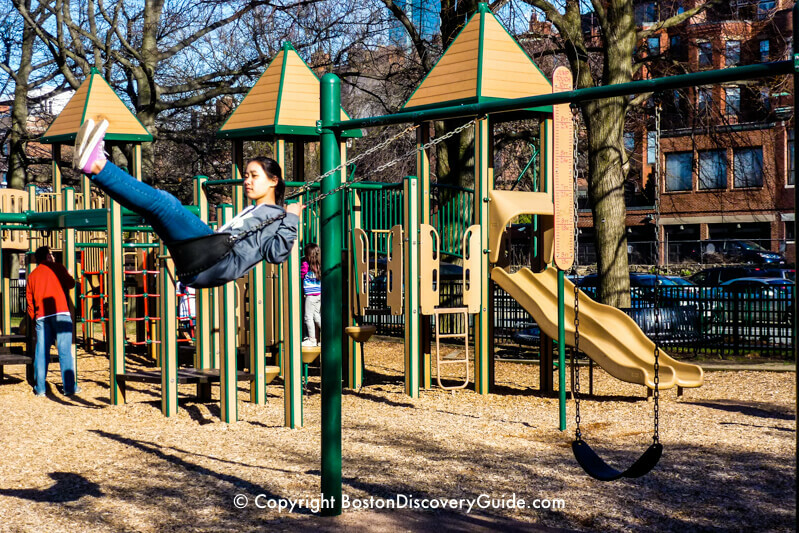 Stoneman Playground (between Fairfield and Massachusetts Avenue) - Features a toddler playground (children 3 and under) with climbing structures, slides, swings, and a pretend car, and a playground for older kids with a more challenging equipment, including a fire pole, monkey bars, and more to climb. Kids always get hungry - so bring your own picnic, or head over to the Charles River Bistro near the Fiedler Footbridge for food and beverages. It's open between April and October, and even offers a Live Jazz Brunch on the weekends! Want the adult-equivalent of a playground where you can get plenty of exercise? 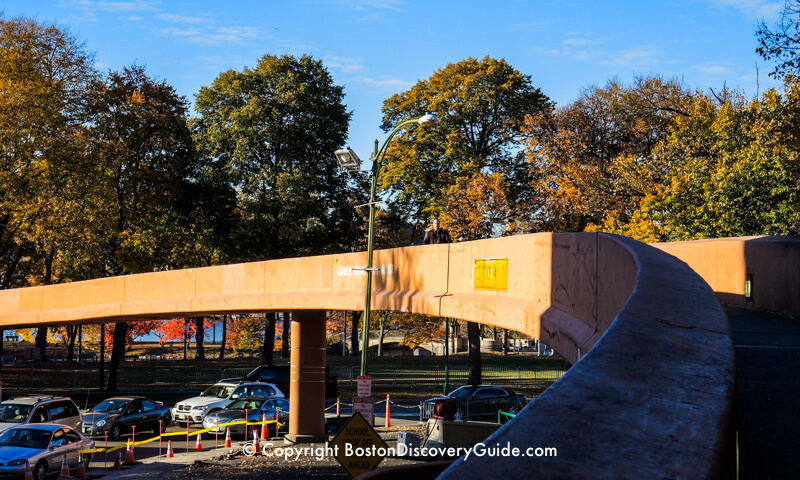 Check out the Exercise Course by the Silber Way Footbridge (located between the Mass Ave Bridge and BU Bridge). You'll find outdoor gym equipment for body weight exercises such as pull-ups as well as for stretching. 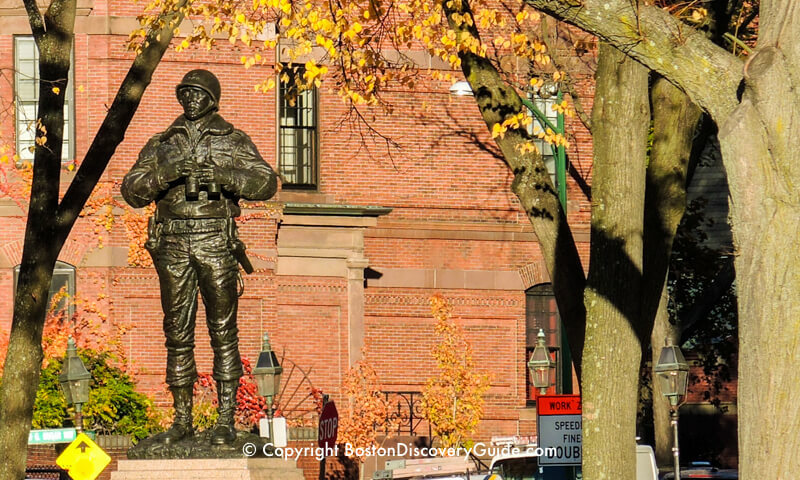 Like every other park and open space in Boston, the Esplanade has its share of statues and monuments dedicated to war heroes, politicians, and contributors to the city's culture. You'll recognize the names of some, and be clueless about others. Most striking is the enormous sphinx-like head of the late Boston Pops Conductor Arthur Fiedler who conducted the first concert at the Hatch Shell back in 1929. Newton-based sculptor Ralph Helmick carved Fiedler's head from layers of aluminum in different thicknesses. But . . . the price for most startling goes to the bronze statue of General George S. Patton, Jr. of World War II fame, shown gazing across the river toward Cambridge, Boston's sister city to the north. He's holding a pair of binoculars, and a gun is strapped to his side. So you have to ask...what is the General doing? Shooting ducks on the Charles? Searching for enemies across the river in Cambridge? Well, no. The original statue is at the U.S. Military Academy in West Point, where no doubt the binoculars and gun don't look out of place. Patton's father-in-law, wealthy textile tycoon Frederick Ayer who lived a few blocks away on Commonwealth Avenue in what is now called the Frederick Ayer Mansion, simply wanted to honor his famous son-in-law by installing this copy on the Esplanade. 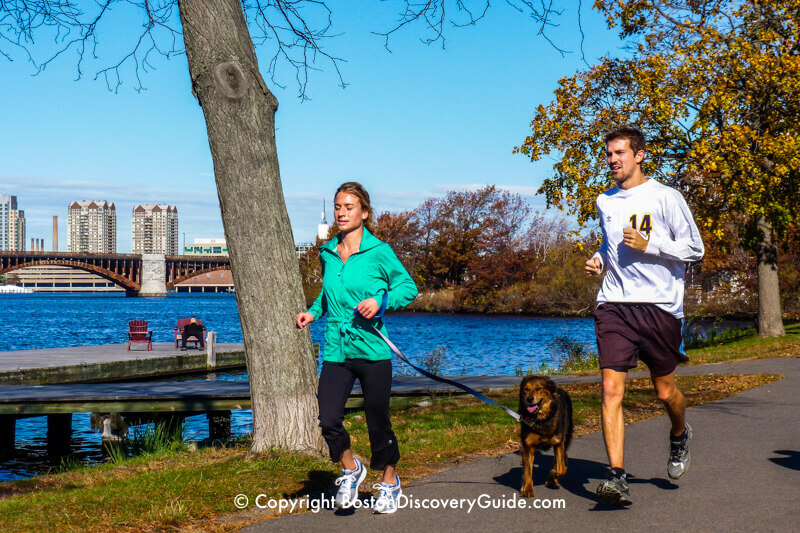 The best way to explore the Esplanade is on foot . . . unless you're on wheels (a bike, rollerblades/inline skates, whatever), snowshoes, cross-country skis . . . you get the idea! The Esplanade is accessible throughout the year. 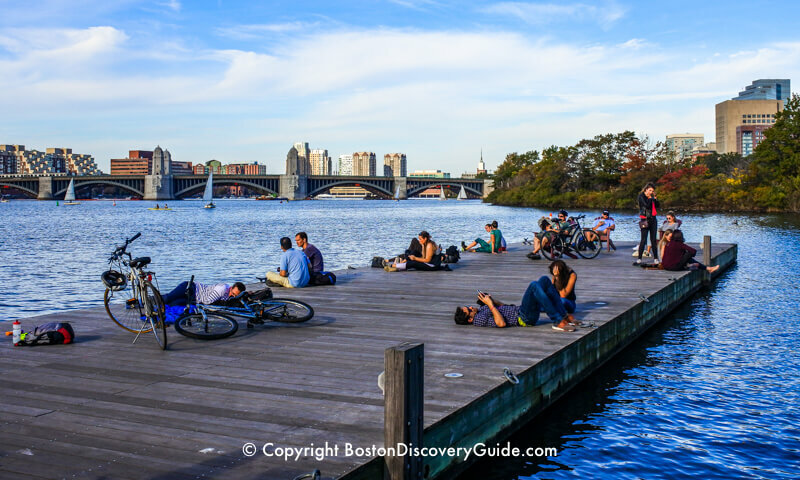 Except for a few limited-access events such as concerts at the Hatch Shell where security perimeters are in place and occasional private fund-raising events at Community Boating Boathouse, you can move freely throughout the park's expanse. 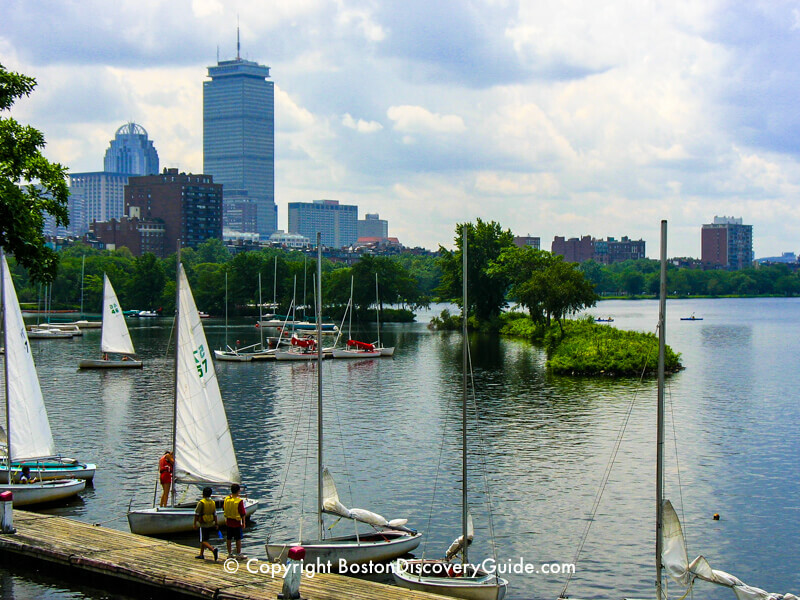 Community Boating, a non-profit organization with a boathouse on the Esplanade near the Charles Street Footbridge, offers affordable sailing and kayaking lessons, as well as access to boats to pre-teens, teens, and adults. Esplanade defined: A long, level area where people may walk. Most abused Esplanade patron: Helen Storrow, who donated $1 million in 1930 to establish a park along the Esplanade on the condition that a road would never be built there. 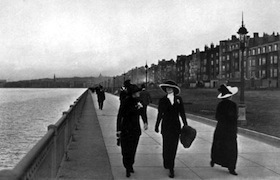 As soon as she died in 1949, the Massachusetts Legislature voted to build a road along the Esplanade and named it Storrow Drive. Heavy traffic on Storrow Drive separates the Esplanade from Boston Proper - so you must use a footbridge to cross over the 6-lane highway.